This year, Jakarta Library and Archive Dept. 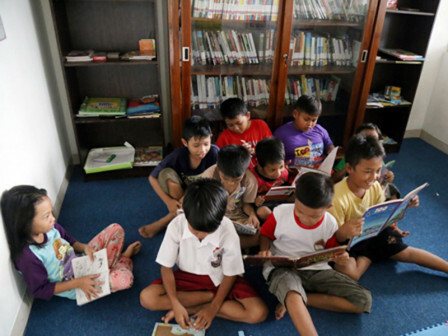 (Dispusip) will add more library facilities in several RPTRAs.
" We will distribute it through related sub-dept. in areas"
Jakarta Dispusip's Deposit Section Head, Priyambodo mentioned, his side will equip bookshelves, puzzle carpets, and 200 sets of educational props. "RPTRAs that need these facilities are located in five Jakarta regions and Seribu Islands," he said, Thursday (10/4). Currently his side is still processing its procurement. Those facilities are targeted to be received in November and his side will distribute it to RPTRAs that are still lack of facilities. "This procurement is also needed to replace facilities that are damaged and not feasible. We will distribute it through related sub-dept. in areas," he stated.